Update: The developers have added an option to the extension to disable the tracking. You find it on the options page when you click on "show Advanced Option". Here you can disable Enable non-personal,anonymous usage statistics to do so. When extension developers want to make money from their popular extensions, they have only a few options to do so. They can ask for donations, offer a paid version, integrate a third-party monetization module in the app, or sell it to the highest bidder. The last two options usually come with some form of user tracking that companies add to the extension to create profiles for use in advertisement or to sell the data to other companies. 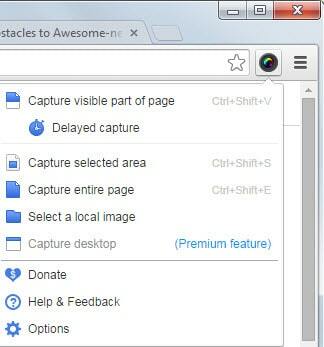 Awesome Screenshot is a very popular Chrome extension. It has more than 1.3 million users and 45,000 ratings with the average rating being five of five stars. It is a screenshot taking extension for Chrome that you can use to take part of or all of a page, add annotations, blur sensitive information and upload or share the screenshot afterwards. Lately, the company behind the product has added a price comparison component to it which it removed shortly thereafter again. Afterwards, it seems that another monetization module has been integrated into the extension. But lets start at the beginning. When webmasters noticed hits to specific pages by bots, pages that bots normally don't access because they are not public and many require authentication to be accessed, they started to investigate the matter. It turned out, that the Chrome extension Awesome Screenshot fed the bot, named niki-bot, urls taken from the user's browsing history. A closer analysis by an affected user revealed that urls were sent over plaintext while others claimed that not only urls but also session data was captured by the extension. If you check the description of the extension on the Chrome Web Store, you will notice the following update if you scroll down. The problem here is that most users may not see the update as it is not displayed above the fold. If you don't scroll down to read all of the description, you won't notice this at all. In addition, there is no warning while you are installing the extension or an option to disable the feature. It is highly recommended to uninstall Awesome Screenshot, at least for the time being until the situation is sorted out. In the meantime, check out the following alternatives instead which offer a similar feature set. Lightshot - is a great extension that enables you to draw a rectangle on the screen that you want captured. Nimbus Screenshot - Create full or partial screenshots after you install the extension in Chrome. Webpage Screenshot [no longer available] - a highly popular extension to take screenshots, add annotations, blur sensitive information or to upload and to cloud storage directly. Here are some alternatives for Chrome's Awesome Screenshot extension which turned spyware recently. Why people don’t settle for windows snipping tool, I just can’t understand. It takes 2 clicks to add blur and 2 more to upload to imgur. But you don’t have to slow down your browser with another extension and you are using a tool that already comes with the system and don’t have to worry about additional security risks. Agreed. I don’t get it either. Window’s built-in snipping tool does the job admirably. Together with Paint.NET if you want more advanced image editing, I see absolutely no reason to use any browser extension crap. Can the snipping tool make pictures of the whole web page, not just the visible part? I don’t know about chrome, but in firefox it’s a build in feature. In Firefox it ain’t no “build in” feature, pal. Well for someone like me, the windows snipping tool is insufficient. #1 it’s separate from the browser and there are no editing tools. Why would I want to save a screenshot, open the image and then use PAINT to edit? HAHA If I do that I sure wouldn’t use ‘paint’ it’s HORRIBLE and only good for viewing bit images that won’t open in other image viewers. #2 I have used ‘snipping tool’ and it’s still on my task menu because it does take an easy great simple shot and even of the DESKTOP and, of course, browser extensions don’t always do that. HOWEVER, on at least 3 or 4 of the computers in this household Windows Snipping Tool stopped working – it would take the snip but you couldn’t download it. The only option was to save to clipboard and PASTE it into the PAINT program, which usually resulted in problems with the image being the size of a postage stamp and also takes too long and why should I do it. Microsoft is aware of the problem with snipping tool and provides as ‘repair’ program that worked at first, but then snip just stopped working very soon and the repair tool wouldn’t fix it. In addition, I sometimes take screenshots of entire webpages that are very long and I want the entire page all on one sheet – Windows Snip will only take a shot of what is visible or less. Most of the shots I want are articles or stories I want to save, and like or need to make small notations to remember specific points of reference. All snip does is a flat crop / save (when it works). Awesome screenshot allows you to save your files online using your google+drive or their own new website created to store and edit files that you can share with other people connected through Awesome screenshot. And by the way everybody !! You know this version of AwesomeScreenshot was completely removed from Google Store and replaced with a CLEAN version and an open apology from Awesome Screenshot. I removed the extension from my browser as soon as I read this article & noticed there was no ‘about’ connected to the ext because it no longer existed in ChromeStore. As far as I know, the old crappy spy version won’t work on Chrome anymore, so even if people fail to remove it manually – it won’t work. Sounds like Rebecca Smith doesn’t know what PAINT.NET is. Also sounds like she doesn’t know how to properly maintain her application/system keyboard shortcuts. Hey man, thanks for the tip! I’ve tired of looking for a good screenshot extenstion, now I’m gonna use built-in one. It has all I need. there is only one downside of snipping tool and that is doesn’t alow you out of the box to capture active menu’s. There is a work around for this if you really need it. Another big advantage of snipping tool is that each change you made to the snip is directly reflected in the clipboard so you can paste it elswhere. My guess is if it becomes too good or to known, they’ll have to remove it like they did with IE. Awesome Screenshot has the (unique among screenshot-taking Chrome extensions) feature of capturing a portion of the current webpage while scrolling the browser window, which the listed alternatives Lightshot and Webpage Screenshot do not have (the latter extension, however, allows for capturing a screenshot of an entire webpage and cropping it to the desired portion). Snipping tool and Print Screen are good enough for me. PrtSc or right-click:Copy image to clipboard and IrfanView work for me for an image, and Ctrl-c – Ctrl-v work nicely into Notepad++ for text when the right options are chosen. For grabbing multiple screen frames e.g. when watching a full screen video, PrtSc with Screenshot Captor are handy. Of course these methods all work regardless of the browser used. For me, Greenshot replaces Screenshot Capture I referenced above. There’s no awkward repeating registration procedure, and so far Greenshot does what I need it to do. So far the unique attributes of Screenshot Capture and Greenshot seem to tell me I can live with Greenshot alone. Thanks to posts here convincing me to try it. Version 2 of Greenshot will no doubt be even better. I use Greenshot. By far the best screencap program I’ve ever used. Removing this evil addon, RIGHT NOW! I use the “Shutter” screenshot app. Works great and…. no spyware!. Does this same spyware issue apply to the Firefox version? Can’t imagine I will now. While I have not analyzed the Firefox version in depths, it appears as if it still includes the shopping “add-on”. Diigo is busily destroying their bookmarking tool by removing features users want to keep and forcing other ones on them. The Diigo user forums are full of threads wondering what this organization’s end game is. Now that I read about the Awesome Screenshot spyware, it makes me wonder even more. This is a nice write up and summary of the issues recently faced by Awesome Screenshot users. I was an avid user until this was discovered and uninstalled it immediately. I’d like you to know that before any of this happened, my company was already in the process of building our own Chrome screenshot extension tool and as of today we are within days of a full release. It’s named FooCapture and I’d love if you would take a look at what we’ve got brewing. So, Martin……..is there an update from these guys………since you slam-dunked them? I have not looked at it afterwards. Still suggest to use alternatives. I suggested our FooCapture screenshot extension above already, but I can assure you all that we do not collect any information on our users other than what is required by Google.